Buoyed by their fuller squad the Storm took the lead with lock Hugh Williams crashing over the line in what is becoming a trademark swallow dive from only 5 yards out. The Storm extended their lead to 10-0when Michael Sumares covered the majority of the field in a solo effort to add 5 more points to his teams tally. 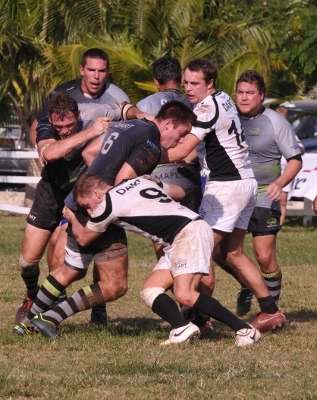 The Pigs, who had previously this season defeated the Cayman Storm 18-35 managed to get into gear when sending James Waters in for 5 points before throwing all but the kitchen sink at the Storm in the closing moments in search of the win. It wasn’t to be for the Trotters but the loss by less than 7 points saw the Pigs earn what may be an invaluable losing bonus point.